Shifting colors, mysterious depths- who wouldn’t love Andalusite? All the warmth of chocolate sable, with hints of gold, olive, and crimson in it’s shadowed depths…. The perfect Autumn gem, actually. In order to rhapsodize over the colors, I have to introduce a new scientific term: pleochroic. This latin word uses pleo meaning to fill or combining form and chroic meaning color. So from the Latin, this stone is filled with lots of combined color. From the practical standpoint of science, this means that the colors of the stone are all present at once, and are shown depending on how the stone is held. In fact, high quality Andalusite is cut to portray as many colors as possible, rather than just one like the majority of other pleochroic gemstones. Not the hardest of stones, with an average MOHs of 7, but sturdy, and not prone to cracking or chipping, which makes it ideal for just about any jewelry application. Caring for andalusite jewelry is easy too- mild soap and water, although ultrasonic or steam cleaners should be avoided. This stone presents itself from bronze to green, to yellow or even pink all over the world. You would think this would allow it to be common in jewelry. Unfortunately, clear gem grade andalusite is less common than it’s opaque variety. 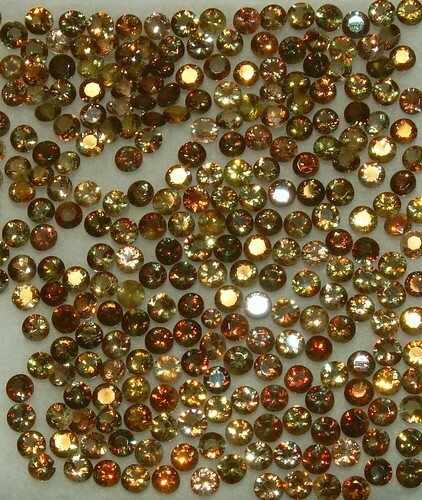 Originally named for samples from Spain in 1798, the gem grade variety is now usually found in Brazil, Russia, Canada, Sri Lanka and Australia. Sometimes, however, the inclusions in a stone increase it’s desirability. Which is the case of Star Andalusite, also known as Chiastolite, with it’s carbon inclusions. 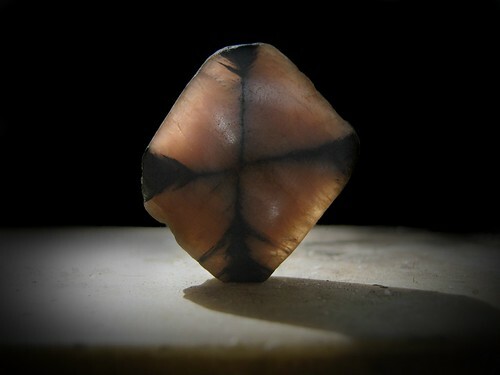 Due to the interior crystalline structure of the stone, these inclusions most often take the form of a cross- leading the superstitious to believe it can protect the wearer from the Evil Eye. At least I have this one, waiting to be set on my bench.